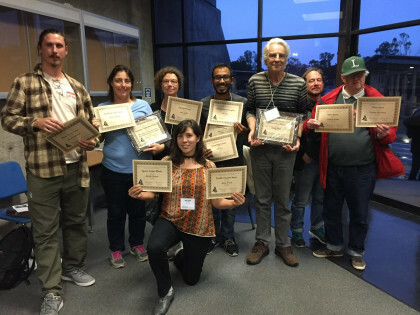 The Laney Tower newspaper won 13 awards at the annual Journalism Association of Community Colleges NorCal conference Saturday, Oct. 15, at Los Medanos College in Pittsburg, Calif. This marks the most awards The Tower has ever won at a JACC conference. The Tower won awards in these catagories: News Story, Feature Profile, Front Page Design, Sports Action Photo, Photo Story-Essay, Opinion Story and Enterprise News Story/Series. A full list of the awards and the winners will be included in the Tower issue of Oct. 27. More than 200 students from 20 community colleges attended the event, which began with a keynote address by San Francisco Chronicle investigative reporter Karen de Sa. Students also attended a variety of workshops, including the Power of Words, Visual Storytelling Techniques and Diversity and Inclusion in Student Media and in the Journalism Classroom. The Tower is the only student newspaper in the Peralta Community College District. Newspaper Production is a hybrid class, which students can take online. Students from all the Peralta Colleges are encouraged to join the Tower staff and contribute stories. You can read the Laney Tower both in print and online at thelaneytower.com.